This is one of those If You Give a Mouse a Cookie type of things. Once I had the Nutella Shortbread Chocolate Chip cookies I had to try more things. I had just bought some Mini Reese’s Peanut Butter Cups in the clearance section of Target and they were sitting on my counter staring at me. 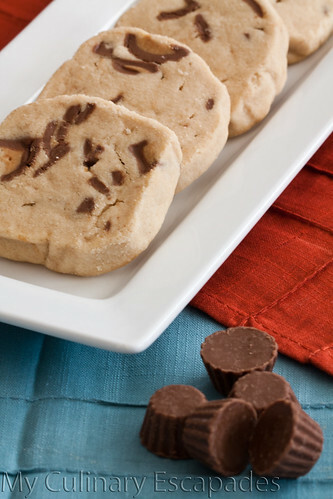 From this is the Mini Peanut Butter Cup Shortbread Cookies were born. My oldest daughter has a severe peanut allergy so while the rest of us can still enjoy some peanuts it has to be carefully monitored and controlled. This often leads to many of us just avoiding it. (She is still able to be around peanuts just not injest them or come into physical contact with them.) When I made these cookies I was quickly reminded of this fact as I had to disinfect the counter and make sure that not even a speck of peanut butter went beyond my notice. Peanut allergies are serious buisness but so is peanut butter, especially for peanut butter lovers like myself. Sometimes you just have to have the savory-ooey-gooeyness that only peanut butter can offer. Enough about allergies, onto the cookies. These Cookies are so crumbly and stick to the top of your mouth peanut butter and chocolate goodness that you are going to have a hard time eating just one. I suggest sitting down with two and a glass of milk. Trust me on this one, these are going to make you weak in the knees. Cream the butter and peanut butter together in your mixer. Once they are throughly combined add the vanilla and mix. With mixer in the off position add the flour, powdered sugar and salt. Mix slowly until all the dough comes together. It should be crumbly. Stir chips in by hand. Get a piece of wax paper out and put the dough down in the middle. Roll into a log and twist the ends of the wax paper. Chill roll of dough in the fridge for several hours. After the dough has chilled preheat the oven to 325 degrees. Line your cookie sheet with parchment paper. This will help your cookies to cook evenly and not brown around the edges. Unroll your dough from the wax paper and cut into 1/4-1/3 inch pieces. If your dough crumbles while cutting, like mine did, just push it back together on the cookie sheet. Bake cookies for 12-14 minutes. The cookies are already brown and should not turn brown around the edges. Allow them to cool for 3-5 minutes on the cookie sheet and then transfer them to a cooling rack to completely cool. Enjoy the classic combo of peanut butter and chocolate.